Showing results for tags '9 volt'. 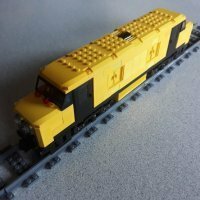 Hello, I am just starting with Lego trains but I am familiar with the trains. I already got HO and Merklin N trains. Here is what I got : Tracks only : 6 x 7499 Flexible and Straight Tracks 1 x 7895 Switching Tracks 1 x 7996 Train Rail Crossing Box : 1 x 60051 High-Speed Passenger Train 1 x 66374 City Super Pack 4 in 1 (damn, I just see I got 66405 not 66374) So : 6 x 8 + 4 + 20 = 72 straight 16 + 20 + 4 = 40 curves 1 crossing 6 switchings I got some goals for my track : - 2 trains can run at the same times - it can reverse a train - it can park unused wagons - One part is for *speed train* so with as few crossing as possible - A station stop track (where a train can stop allowing other to run) - Not a too large nor long layout (due to WAF) 3 meters long and as narrow as possible Due to Super Pack 66405, I will have use flex track (dont like them much) because 4 curves are missing. I will place the flex track in the reversing loop area. Any advice about my track layout is welcome !!! Current size is 2.88 m x 1.22 mm. Ps : Sorry for my poor English.